Marcus Kretzer (born May 9, 1965 in Hilden, Germany) is a German pianist and music teacher. Since 1979 he regularly gives recitals and concerts with famous orchestras and conductors worldwide. His art of piano playing is described as "new and unheard. A deep sensibility, attended by resolute authority. A musical genius, combined with an extraordinary technical virtuosity. His play is ingenious, intelligent and erudite as well as subtle and touching, steeped in almost unreal tenderness. The play of a true master of the piano.". As piano pedagogue Kretzer acts in Germany and abroad in which his comprehensive teaching method lastingly influences the future generation of pianists. Kretzer spent his childhood and youth in Solingen. He grew up in a musical home. Encouraged by his mother playing the piano, he got his first piano lessons of his own volition at the age of seven years and decided soon thereafter to become concert pianist. The Czech pianist and piano pedagogue Drahomir Toman, a grandson pupil of Liszt and fellow student of Friedrich Gulda, had great influence  on Kretzer's further musical development to 1986 - from this school also the pianists Ivan Klánský and Wolfgang Manz originate. After school Kretzer studied until 1988 at the Hochschule für Musik und Tanz Köln with Aloys Kontarsky. From 1988 he continued his studies at the Hochschule für Musik und Theater Hamburg, graduated in 1993 the additional cultural management studies with Diplom and completed his musical studies in 1996 with concert exam, interpreting Rachmaninoff's Piano Concerto No. 3 in Laeiszhalle in Hamburg which caused a strong sensation. 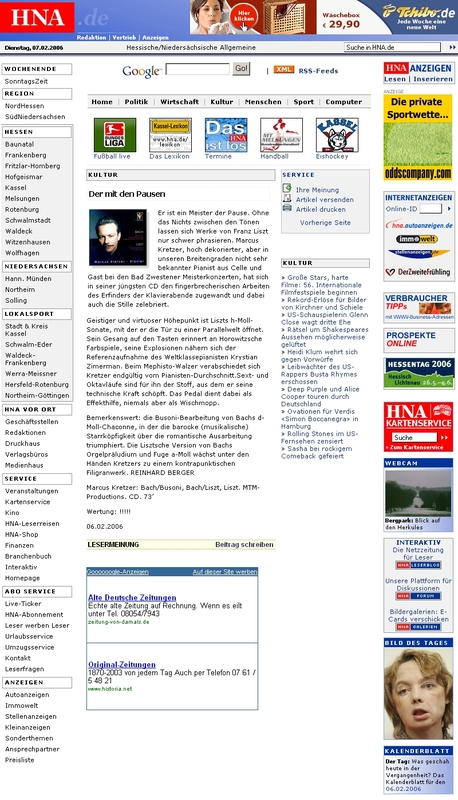 As a profound expert in Roman Antiquity too he studied Roman History from 1996 to 1998 at the University of Hamburg and Science of music at the Hochschule für Musik und Theater Hamburg at the same time. With his holistic understanding of art, which makes him deal with the Visual and Performing Arts, with literature, history, archeology and architecture, he is a late representative of the universally highly educated, "romantic" artist Typus, also herein Claudio Arrau not unlike, which in turn inspired other artists: thus the composers Franck Adrian Holzkamp and Ulrich Skubella dedicated works to him, the poet Raymond Mair wrote a sonnet, the synaesthetic painter Lieselotte Leier created a painting after they had heard Kretzer play. In his first public recitals in Germany Kretzer appeared with 14 years, abroad he debuted with 17 years in Rudolfinum in Prague. He participated in numerous national and international piano and music competitions and won eight First and a plurality of Second Prices. Kretzer has performed in almost every country in Europe, North and South Africa and in Central America. His artistic career has introduced him to renowned conductors such as Daniel Barenboim, Michael Beck, Sebastian Beckedorff, Leonard Bernstein, Hernán Caceres, Sergiu Celibidache, Victor Costa, Luciano Di Martino, Antón Kolar, Sebastian Lang, Enrique Pérez Mesa, Gerd Schaller, Michael Schmidtsdorff, Edgar Seipenbusch, Saulius Sondeckis, Carlos Spierer, Patrick Strub, Christian Süß or Jacques Wijnen. He played with orchestras such as Arcata Stuttgart, Bergisches Kammerorchester, Bergische Symphoniker, Hamburger Bachorchester, Hamburg Symphony Orchestra, Lithuanian Chamber Orchestra, Magdeburgische Philharmonie, National Symphony Orchestra of Cuba, National Symphony Orchestra of Guatemala, Philharmonie der Nationen, Sinfonia Varsovia, Staatsorchester Braunschweig, Symphonie Orkest Eindhoven. He appeared several times in music festivals, such as the Cubadisco fair and music festival, the International Eisteddfod in South Africa, the Europäisches Klassikfestival Ruhr, the Mosel Musikfestival, the Rheinischer Klaviersommer, the Salzburg Festival or the Schleswig-Holstein Musik Festival. Kretzer's other artistic activities include multiple co-operations with John Neumeier and the ballet of the Hamburg State Opera, the Goethe Institute and Embassies of the Federal Republic of Germany, vocal accompaniment and chamber music as well as radio and television appearances for ARTE ETERNA CUBA, CUBA-TV, NDR, Radio Allegro South Africa, Radio Hamburg, Radio Schleswig-Holstein, RTL Television, Sat.1, WDR, ZDF. As an active member of Lions Club International he periodically gives charity concerts, whose revenues help to support the various charitable activities of this largest non-governmental organisation – the only service club that officially belongs to the United Nations. Due to his formation and continuative mastercourses with Tatiana Nikolayeva, Svjatoslav Richter, Aquiles and Nelson Delle-Vigne Fabbri, Homero Francesch, Yara Bernette and Fausto Zadra his pianism combines the eastern European schools of Theodor Leschetizky and Heinrich Neuhaus with the South American tradition of Vincenzo Scaramuzza - the press therefore draws comparisons with Horowitz, Kissin and Zimerman  or Arrau, Argerich and Pollini. Kretzer's play thereby is described as intellectual comprehension of the text, which is in fact the secret to the legitimacy of natural, emotionally justified forming. He gives area to the inspiration of the moment without getting lost in arbitrariness or mannerisms. He puts manual virtuosity in the service of precise articulations, rhythmic precision and a dynamic highly versatile, orchestral tone intended color palette. Kretzer's programmatic focuses lie on the works of Johann Sebastian Bach, also in the orchestral extended versions of Busoni, on the sonatas by Domenico Scarlatti, the sonatas and piano concertos of Wolfgang Amadeus Mozart and Ludwig van Beethoven, on the oeuvres of Frédéric Chopin, Franz Liszt, Isaac Albéniz, Claude Debussy and Sergei Rachmaninoff. His involvement with contemporary music is reflected in his recording of the dodecaphonic piano works of the eastern German composer Rudolf Halaczinsky (1922-1999). Following the romantic tradition, Kretzer created sophisticated and effective paraphrases on Argentine Tangos and transcriptions of classical orchestral works for one, two and four pianos - the latter he performed in 2008 during a tour of Germany with the ensemble "Kla4" (Piano4te). During his studies in Cologne Kretzer taught at the Youth Music and Art School of the city of Remscheid, where he also led the department of piano. While studying at the Hochschule für Musik und Theater in Hamburg he was initially employed as tutor of a major class and from 1998 to 2001 as professor. Since 1989, Kretzer gave master classes both at home and abroad, including at the Schleswig-Holstein Music Festival, the Instituto Superior de Arte in Havana/Cuba, the Edna Manley College of Visual and Performing Arts in Kingston/Jamaica, the Conservatorio de los tres Mundos, Granada, Nicaragua, the Colegio San Agustin in David, Panama, the Conservatorio Nacional de Música in Santo Domingo, Dominican Republic. His students were multiple winners at prestigious piano competitions. With his piano playing and teaching method he is certified "to have great influence on the future graduates of high schools and their development to an international level". Among his most important students are Natasha Garcia-Guinot, Francisco Paredes-Llanes, Nora Maria Lastre  or Madarys Morgan Verdecia. ^ "Raymond Mair". jamaica-gleaner.com. Archived from the original on 2013-12-10. Retrieved 2012-06-20. ^ "International Press Articles". Marcus-kretzer.com. Retrieved 2012-06-18. ^ "Appearances in Central America". Marcus-kretzer.com. Retrieved 2012-06-18. ^ "Interview with Marcus Kretzer on Cuban Television". YouTube.com. Retrieved 2012-09-11. ^ "JMKS Remscheid". Musikundkunstschule-remscheid.de. Retrieved 2012-06-18. ^ "ISA". Isauniversidaddelasartes.wordpress.com. 2011-05-27. Retrieved 2012-06-18. ^ "Ciclo International de Jovenos". Victorrebullida.blogspot.de. 2009-02-20. Retrieved 2012-06-18. ^ "Escuela Superior de Música Reina Sofía". escuelasuperiordemusicareinasofia.es. 2010. Retrieved 2012-07-14. ^ Konrad-Adenauer-Stiftung. "KAS". Kas.de. Retrieved 2012-06-18. ^ "Chopin Roma". Chopinroma.it. Archived from the original on 2012-07-04. Retrieved 2012-06-18. ^ "CMF". Concours-musical-de-france.com. Retrieved 2012-06-18. ^ ""Masefield"-scholarship". Toepfer-fvs.de. Retrieved 2012-06-18.